It was my first time in Mindanao last weekend. I went to the Land of the Champions and Land of Tuna, General Santos City, Philippines. It was a fantastic experience! Day 1 - Magandang GenSan! Jomar, Mam Chelle, and I left Makati around 6:00 am for our flight at 7:20 am. 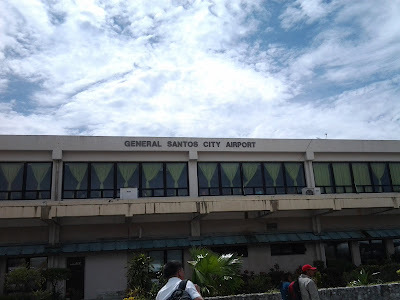 After rushing through the airport and paying the terminal fee, the plane took off at around 7:45 and we arrived at the General Santos City International Airport at about 9:30 am. Upon deplaning, we met with Ms. Aileen and her son, Miggy, and Vincent. All of us rode the van waiting for us from the East Asia Royale Hotel. We left our things and rest for a while in our rooms. After a few minutes, we went to Ranchero's Grill and Restaurant for lunch.